This morning country superstar Luke Bryan took to the Bobby Bones Show at iHeartRadio to share his newest track “Light It Up” and the story behind the song. Take a listen to the track then see what he had to say about writing with Brad Tursi, of Old Dominion. Country Music News Blog participates in advertising programs that help fund the operation of this site. For more information please visit our privacy statement. 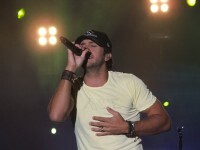 This entry was posted in Luke Bryan, New Music, News by Shauna "WhiskeyChick" Castorena. Bookmark the permalink.